The EIGR series consists of high-speed routers that link two 10/100/1000 Mbps Internet Protocol (IPv4) networks — passing appropriate traffic while blocking all other traffic. One network is the local-area-network (LAN); the other is the wide-area-network (WAN). The built-in stateful firewall passes communication initiated on the LAN-side while blocking WAN-side initiated communication. With Port Address Translation (PAT), LAN-side clients can access the Internet. Network Address Translation (NAT) allows a one-to-one translation between LAN-side and WAN-side devices. With Port Forwarding, LANside devices can be accessed from the Internet. 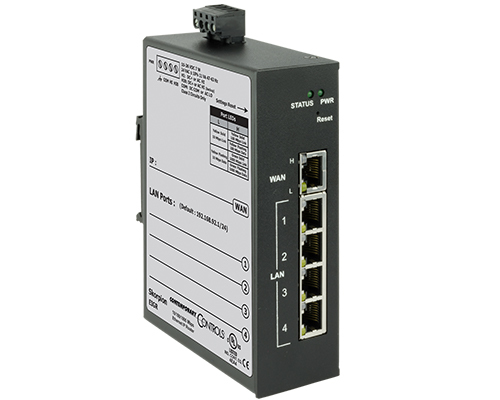 The EIGR-E incorporates a four-port Ethernet switch for multiple LAN-side connections. An external Ethernet-based modem — cable or DSL — can be used to connect to the Internet. DSL modems connect via the PPPoE protocol. The EIGR-E operates over 0 to 60°C temperature range and the EIGR-EX operates over −40 to +75°C temperature range. The EIGR-V incorporates a four-port Ethernet switch for multiple LAN-side connections. An external Ethernet-based modem — cable or DSL — can be used to connect to the Internet. DSL modems connect via the PPPoE protocol. The EIGR-V series includes real-time clock and OpenVPN client/server functionality. As a VPN Server, up to 15 router clients and 15 PC clients can be supported. The EIGR-V operates over 0 to 60°C temperature range and the EIGR-VX operates over −40 to +75°C range.